This documentation is meant to be viewed from an Orbiter Installation. Online preview will have many local links broken, this is normal ! What does 3d audio mean? 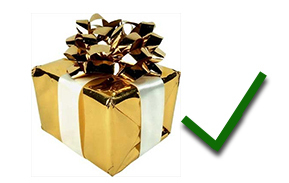 Packaging your addon - IMPORTANT! Even if there is no sound in space, a vessel is always a noisy environment. In fact in MIR it turned out to be a real problem, with sound levels up to 90db. 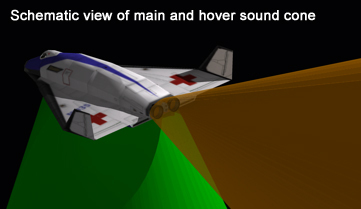 OrbiterSound reproduces some sounds that may be heard while travelling in a spacecraft, even though some are fictional. To fit your needs, OrbiterSound is fully customizable. You can even have music in space! Did you know? May 17 2012 was the 10th anniversary of OrbiterSound. See 2002 archived web page. For start, try the demo scenario and make sure to read the description. You'll find the VesselSDK and MFDSdk in folder "Sound/OrbiterSound_SDK"
NOTE: OrbiterSound 4.0 runs only on Orbiter 2010 or higher. NOTE: OrbiterSound 3.5 runs only on Orbiter 2006. 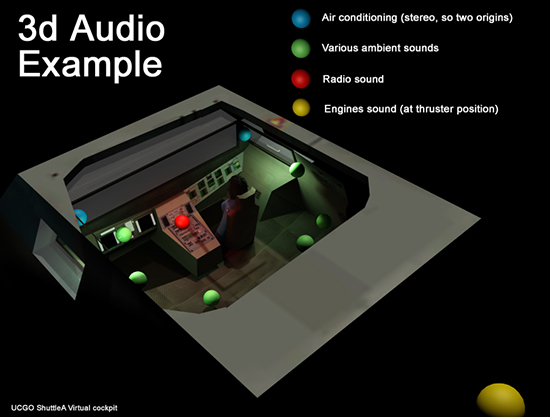 3D audio in OrbiterSound 4.0 is a complete 3D simulation of audio positioning - different sounds can come from different places in a vessel. With two speakers you'll have left/right panning (given the head position and orientation) and with a quad system you'll have also front/rear panning. For a default vessel (without configuration or specific programming) the positions of sounds are automatically generated by sound type. 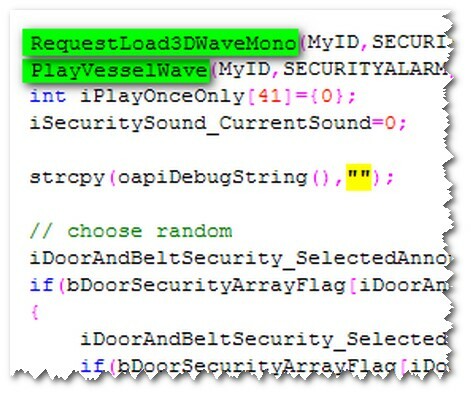 Some sounds, such as ambient and radio, are pseudo-random, with the name of the vessel class used as random generator (this means that sound position will always be the same for a vessel type, but can vary from one type to another). Note that the RCS sounds are a special case. The default automatic guess of position may not be accurate, because Orbiter doesn't provide the correct position of RCS exhaust. Using the configuration file you can manually position them. If you don't like the result you can deactivate 3D RCS in the SoundConfig program. 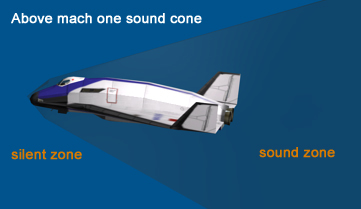 OrbiterSound 4.0 also introduces the 3D sound concept cone effect: the sound being louder in front of the emitter and eventually masked by the hull. This applies to main, hover, retro and airspeed wind sound. 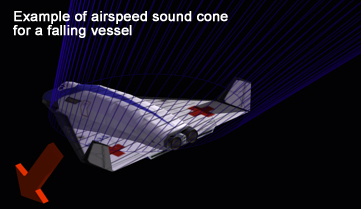 The airspeed's sound cone on its part is dynamic, given the speed vector of the vessel. Last, for speed above Mach 1, you'll have a silent zone in front of the ship. Notice you can disable the sound cone effect in the program's configuration. If you are able to run Orbiter, OrbiterSound should run also. Just take care that you MUST have DirectX 9 or higher installed. If you get an error message about dsound.dll you have a bad or no install of DirectX. With 3d sound it's important that the speakers are correctly positioned, otherwise there will be an offset between the sound origin on screen and what you hear. It is also important to correctly set your Windows sound configuration because OrbiterSound plays through DirectX's DirectSound API. With a quadraphonic sound system you'll be able to hear sound in full 3D, with sounds coming also from front/rear. 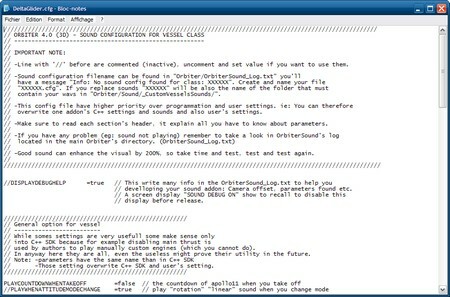 You can configure OrbiterSound using SoundConfig.exe which is located in Orbiter's root directory. Fortunately the solution is simple: since the vessel's configuration file has top priority, you can easily edit it to make each vessel exactly fit your taste. 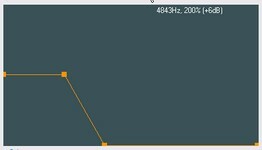 For advanced users, you can also modify some general values or factors of OrbiterSound here: Advanced_configuration.cfg. 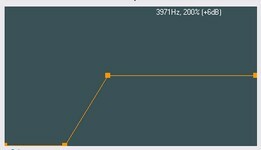 It allows you, for example, to modify the frequency of OrbiterSound (up to 44100hz) or to play sounds even when Orbiter's window doesn't have focus. The radio/radar/mp3 MFD allows you to tune ATC chatter frequency and temporarily* change some settings for MP3 and radar sounds. It works as any standard Orbiter MFD and you can activate it the same way with the "SEL" button. If you want to add more MP3s to the list, open the MP3 folder and read the help. 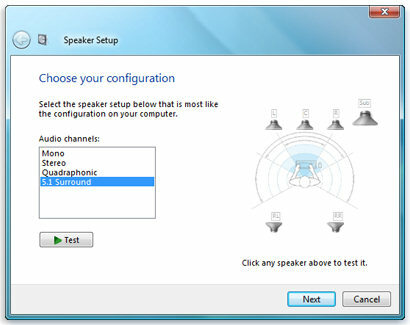 * If you want settings to be permanent use the SoundConfig program. This selects one of the folders that contain different ATC files; it uses a radio feeling so it's like you select a radio frequency. For example you can start with Canaveral control and switch during flight to ISS communication (notice that only three "frequencies" with few sounds are provided by default to keep the size low. See More_Atc_help.txt). 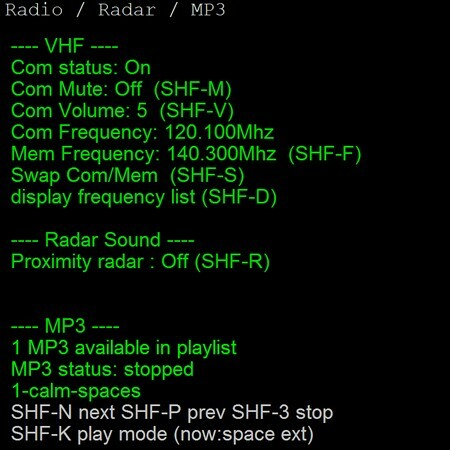 SHIFT-D : (D)isplay a list of available "frequencies"
It works like an aircraft radio. You have a mem frequency where you enter the one you want and must swap it to com frequency to make it active. "Status : Off (bad frequency)" is shown when you switch to a frequency that has no folder or no sound files in it. A small stutter can be heard when you switch frequency. 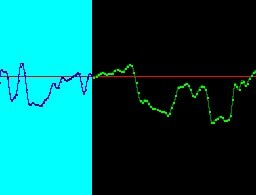 This is normal due to the WAV reloading. 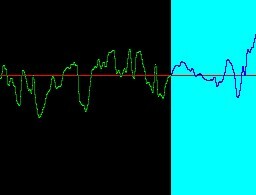 OrbiterSound remembers the last frequency used between Orbiter sessions. When you enter an atmosphere at high speed, the radio sound becomes more and more noisy until it disappears. This simulates the blackout due to ionization. You can switch the radar bip sound on/off and set it to detect only the station or any object. The MFD also displays the distance to the target. SHIFT-R : Switch (R)adar mode between "Off"/"Station"/"All". The MFD shows the distance to the target's center, minus the radius of the object; this can differ from other Orbiter displays, such as the Docking MFD. If the value is negative (inside a station) it shows "NEG" instead of the distance. A simple text file allows you to change all the 43 default sounds and 20 options of a vessel type and you can even define animations sounds. With a few text lines and some sounds that you can find online (See Sound design tips) you can make any vessel sound completely different. To learn more or start customising a vessel see the Sound/CustomVesselsSounds folder and make sure to read the read me. 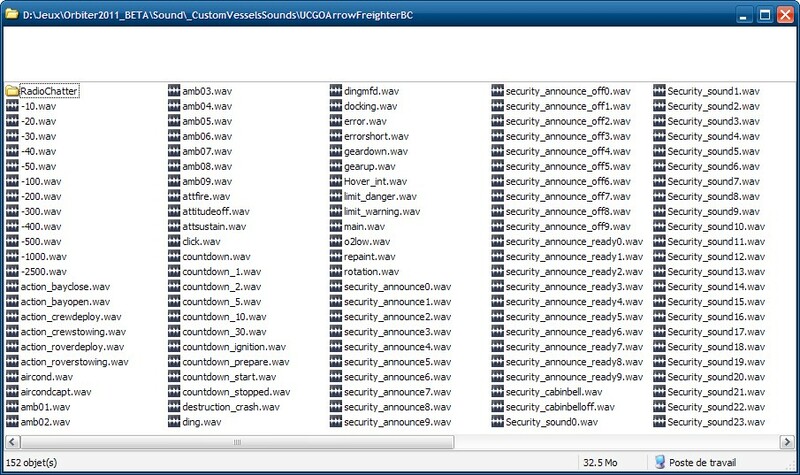 Important to know: The configuration files (.cfg) have higher priority than Sound C++ SDK and user's configuration (SoundConfig.exe) concerning the replacement of the 43 default sounds and the 20 sound options. This was done so a vessel's sound not be written in stone. You can therefore overwrite the author's default sounds and user's settings, allowing you to make per-vessel options (you may like aircond or ATC in one and not in others). Please note that the configuration can't do nothing for private sounds that are loaded and played independent to the 43 default sounds. An author, for example, can disable default main thrust and load & play it's own. If you are a vessel developer, the simplest and quickest way to modify the sounds and options of a vessel is to use the configuration file. However, this won't work for all the special events sounds you may want for a nice addon (or for a MFD). The Arrow Freighter for example has at least 150 more sounds than a default vessel. If your addon already contains some C++ code, integrating the OrbiterSound SDK, plus loading and playing the required WAV is really simple and quick. You also have access to all the options of a configuration file. To see the doc, code example and library to integrate into your project, open the Sound/OrbiterSoundSDK folder and make sure to read the various "read me" files. Important to know: Configuration files have priority over programming. A vessel's configuration file can overwrite your ReplaceStockSound() and SoundOptionOnOff() parameters. See above configuration file. Each base can have its custom ambiance sound that will play near ground, within a given range. This sound can be mixed at various degrees with the planet's wind sound (see below). Airport sound, birds, forest, traffic or town sound can add a lot to the feeling of a base. Making a new base sound add-on is really easy, so open the Sound/CustomBaseSounds directory and be sure to read the "read me" file. To hear an example, launch the demo scenario "Planet Bases and Wind sounds"
Do you want to give a planet it's unique feeling? The terrible storms of Jupiter of Jupiter or the gentle breeze of a sunny day on earth? This is now possible! And each planet can have a playlist of as many as 50 wind sounds to shuffle one from (just to not sound repetitive). Making a new wind add-on is really easy, so open the Sound/CustomWindSounds directory and be sure to read the "read me" file. Sound design is an art: a good sound can enhance the visuals by 200%, while a bad one can degrade it. I'll explain here some tips about where to find good sounds and how to rework them to get a good result in OrbiterSound. I'll not explain which sound editor to use and how to use it, there's plenty of tutorials on the net about this. The first most important thing is to find a good base sound; you can find a lot of rocket thruster sounds on YouTube (search with "rocket", "thruster", "Hydrazine", "space shuttle" etc. etc.). For other sounds (ambience, wind, click, rumble and pump) you can search on freesound.org. Take your time to pick the right sound because in the end, the quality will depend about 80% on the base sound. First record it with the highest quality possible at 22050hz 16 bits stereo (in case of youtube, choose "HD" whenever available). Cut the start and the end to get a good and stable sound of about 4-6 seconds (beware of variations, in a short loop it would give a steam engine effect). I've taken the sound of this video and, after cut, I got this sound: booster_thruster_raw.wav (I've done this tutorial quickly, you may find a better sound). If you play it looped (as it will in Orbiter) you'll hear a click noise. 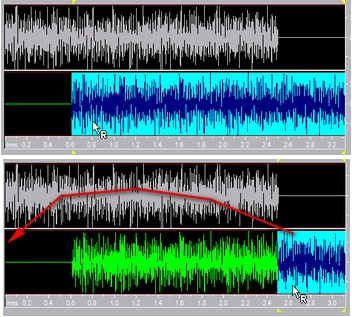 When cutting, you must pay attention that the start and end match: first cut the start as the sample crosses the zero line (otherwise you'll hear a click when the sound starts playing) and then cut the end the same way. Paying attention to the phase (ascendant/descendent) may ensure that the loop is perfect. I got this result: booster_thruster_goodcut.wav which is descent for a booster (it's a noisy and saturated sound but let say this is how we want our booster at launch). If you want to equalize and add bass or treble you must ensure to not saturate the sound: normalize it first to 80% or less, work on frequency and, at the very end, normalize it again to your final volume. Here I have enhanced the bass and removed a bit of the high and middle frequency: booster_thruster_equalise.wav (you may need to cut it again after some operations to remove the click). Now we have a nice and flat stereo booster sound. The reason is that the two channels are strictly the same, meaning there is no wide perception. To make it perfect you'll need to shift one channel by 0.5-1 second, which works well for constant sounds like thrusters. Some sound editors may have this effect included (I didn't find one) but any editor that allows you to work on one channel will do the job. Upper image: Select one channel, cut and paste it at a 0.5-1 second delay. Lower image: Cut and paste the remaining part to the start, remove the empty end and make sure that there is no click. Be precise, use zoom at sample level. This is not only for cosmetics: given a head position, in 3D, stereo channels may have the same origin and, if both channels are strictly identical, they'll sound like played in a bathtub. Once you have your sounds, you can start replacing any of the 43 waves of one vessel-type using the sound configuration file and finally package your sound addon. A quality addon is also well packaged. The zip must be properly named, contain a ReadMe.txt and files must go to the proper place when the add-on is extracted in Orbiter's root directory. If you don't know how to, this chapter is for you. The ReadMe must describe: what the addon is for, which version, your username and how to install it. The ReadMe.txt must be placed in your addon's folder, NOT in Orbiter's root directory. Unzip in Orbiter 2010's directory, all files will go to their proper place. Create on your desktop a folder named for example "OrbiterZip", into this folder recreate the complete Orbiter path where your addon's files will be placed. Place all your addon files, including the ReadMe.txt, in their proper folders. Then archive the root folder using your favorite archiving program (for WinZip right-click it and select "Add to Zip file..." in "WinZip" menu). To be user-friendly, the archive's name must clearly identify your addon. 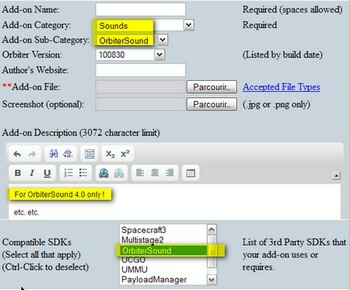 Vash from OrbitHangar has kindly added a new Sounds category, so users will find your sound add-on more easily. Don't forget to tag it also "compatible with OrbiterSound" and maybe drop a note that it's compatible with only version 4.0 if you use the new configuration file (the older OrbiterSound versions are outdated for Orbiter 2010 anyway). Thanks, of course, to Martin for his wonderful simulator and thanks to the whole Orbiter community for the support and friendliness over the past ten years. 'MikeB' for reviewing this documentation and all the txt files. Emil Nechifor aka Marvin42 for double-checking documentation files, correcting SDK comments as well as a huge amount of txt and documentation files changing constantly as the differents versions were issued. The alpha version testers that have got all the worse bugs: siriusfett, cslevine, SolarLiner, Alexandre, MerciMartin, Joffrey. The beta testers: siriusfett, cslevine, SolarLiner, MerciMartin, asmi, jVincent Majerowicz, jgrillo2002, marvin42, paddy2, Ripley, gattico, Proximus, darkvoid, dgatsoulis, cipher169, Scattykat, sunshine135, Jim Lovell, hedzup456, jacquesmomo, reekchaa. 'Scattykat' for the welcome voice. Calm Spaces by Pawel Blaszczak standard license bought on shockwave-sound. It is strictly forbidden to redistribute or sell this file without the appropriate license. STS sound reproduced with authorisation from http://www.uhf-satcom.com/. Thanks to Paul and contributors of uhf-satcom! Dynamicell, Benboncan, inchadney, Bosk1, dobroide, Jovica, suonho,klankbeeld. Halleck, m_O_m, estlacksensory, JasonElrod, digifishmusic, Halleck, Tr4ck3r,TexasMusicForge, Erdie, jpnien, FreqMan,sandyrb, Slanesh. My website: Dan's orbiter page. 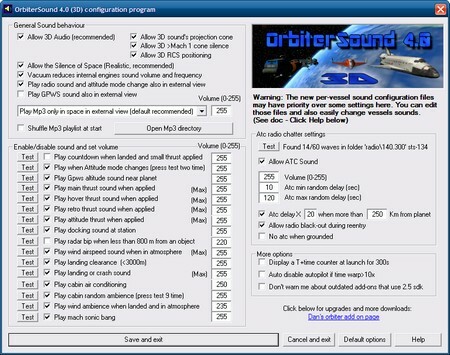 OrbiterSound 4.0 is freeware, like Orbiter. It is forbidden to make any money from it in any manner, cd distribution etc. It is forbidden to distribute OrbiterSound. I prefer to keep it on a central download point.